No finishing date has been given for work being carried out to repair a collapsed sewer pipe in Melton town centre. 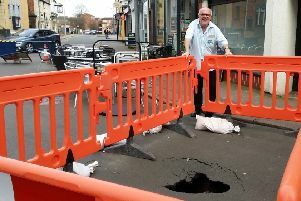 Work teams from Severn Trent first arrived on site, in King Street, almost a week ago, after a sinkhole opened up. Leicestershire County Council officials fenced off the hole when it first appeared, on Friday February 15, and closed the road to traffic. It remains closed and the water company told the Melton Times this afternoon (Tuesday): “Work is continuing by our teams to repair the collapsed sewer pipe on King Street, and we’ve been using cameras to help inspect the pipe to make sure it doesn’t cause any further problems.